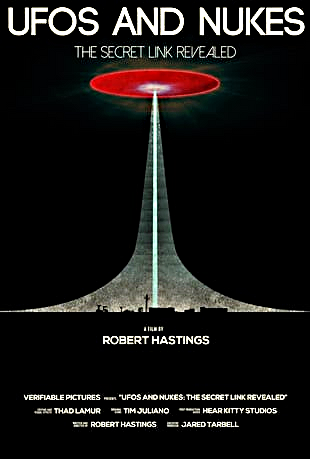 I recently bought and down loaded Robert Hastings' UFO documentary film "UFOs and Nukes: The Secret Link Revealed." This is supposedly Hastings' milestone achievement in conjunction with his book UFO and Nukes which was published some years back. The major theme of the documentary appears to be that UFOs and its occupants have been observing the US and the former USSR during the Cold War. These alleged observations center around both nations' nuclear weapons sites. Basically extraterrestrials have been attempting to send both nations a message or warning concerning the use of nuclear weapons. The documentary makes an attempt to establish the notion that UFOs have not only overflown our nuclear weapons sites, but have made numerous attempts to disrupt the operational status of our nation's ICBM forces. On some occasions, UFOs are allegedly to have actually caused Minuteman ICBM missiles to drop off strategic alert. Hastings offers the viewers what he believes to be compelling evidence that supports his premise. The film is 48 minutes long. The overall quality of the production is good when it is compared to past attempts at depicting the UFO subject in documentary form. I use the following as an example of very poor quality: New Discovery Channel UFO Program's Segment on Robert Salas and Oscar Flight. I believe that Hastings' production crew out performed Discovery Channel on this one. The quality of the film's sound is good. The narration is clear and understandable. The same can be said of the witness presentations for clarity of content. The sound from the archival footage is also easy to hear and comprehend with no noise distortion noted. The graphics are clear and easy to read. I had issue with the use of supporting documents fading in and out with a change in background color. This is a personal opinion as others who view the film may not see this as a distraction. In this article, Tim Hebert claims there is no evidence that the Oscar flight shutdowns during my UFO event in 1967 ever occurred. He is simply wrong in that assertion. I have testified in an affidavit, written two books that cover the incident in detail, and have spoken about it openly and answered any and all questions honestly and to the best of my ability for over twenty years. I am a graduate of the USAF Academy and served honorably for seven years. My testimony is evidence. My commander in the capsule, Col. Fred Meiwald, has validated the incident in oral and written testimony. The testimony of this highly respected career officer is evidence. The affidavit of Robert Jamison, another USAF officer who was in charge of the targeting team who confirmed all ten missiles of Oscar flight were disabled on March 24, 1967 is also evidence. This may not be enough evidence for some, like Herbert, but it is there. My motivation for presenting my story is not to convince everyone, it is simply to inform the public that I, and others were witness to this incident that is evidence of the UFO phenomenon. Robert Hastings has produced an accurate depiction of my incident and that of many others in his recent video. I have known him for over twenty years. His work in interviewing witnesses, verifying their accounts, researching details has been exceptional and deserves the gratitude of anyone interested in uncovering the truth about this phenomenon. He has established himself as one of the most respected researchers in this field. Whatever the motives of a debunker like Herbert, he has no standing to discredit the honor of any of us witnesses or that of Robert Hastings. Interesting that you say that, "...a debunker like Herbert [Hebert], he has no standing to discredit the honor of any of us witnesses or that of Robert Hastings." Nowhere have I questioned the honor of you or any of the witnesses that Hastings has brought forth either in the written word or on video. As compared to others, I've treated everyone with respect. You'll find that throughout my blog articles no one is branded as "liars." What I've done is highlighted the numerous disconnects and confusion that have circulated for years regarding the UFO cases brought forth, by you and Robert Hastings. To be frank, there are many of these disconnects that you and Mr. Hastings have written as factual evidence which I disagree. I've highlighted these with links to my blog posts at the end of my review. Let me be clear on this matter. I've intentionally avoided branding you and the other former officers as "liars" and "opportunist" in deference to your/their service. I served in the very squadron that you were assigned to...the 490th Strategic Missile Squadron. Per Mr. Salas: "... Tim Hebert claims there is no evidence that the Oscar flight shutdowns during my UFO event in 1967 ever occurred. He is simply wrong in that assertion. I have testified in an affidavit, written two books that cover the incident in detail..."
Yes, I'm well aware that you have done so, but you misunderstand my point being that there is no official AF/SAC/FTD documentation that shows that an incident occurred at Oscar Flight. There is a Blue Book case on the Belt UFO sighting, roughly the same day as your allegation, but no investigation for Oscar Flight? This is odd, would you not agree? There is a full fledged engineering investigation for Echo Flight which happened a week prior, but nothing for Oscar. Again, this is odd, would you not agree? Now, combine your claim with the total absence of eye witnesses to come forward and corroborate your claim (FSC, site security teams, Facility Manager, etc). This is odd, would you not agree? Where are the AF-117s, the affidavits, the phone interviews, the on-camera segments for Hastings documentary? There are none. This is bizarre, would you not agree? Approximately one year later there is a UFO incident at Minot AFB involving missile security, maintenance, and a B-52 overflying the flight area. Well over 100 plus pages of documentation is accumulated with written statements (AF-117), MFRs, SAC/FTD message traffic, etc. And...there is no documentation for Oscar. Do you now understand my skepticism? I've corresponded with Frank Warren last week and gave my assurance that I would view Robert Hastings' documentary. I have done so and written a review. Keep in mind, I'm not an expert in film production, but viewed it as a casual individual. It was a quality production when it is compared to past UFO offerings...BTW, I enjoyed it. But the content broke no new ground to change my opinion. And it is my sole opinion. You and others may accept it or not just as you and Hastings ask me and others to accept your premise. All I am is a former Minuteman II launch officer/staff officer/Systems Command program manager that is offering an opinion based on reading and analyzing the claims made by you and others. I had an incident happen to me in late 1998. Although I had seen Aerial Phenomenon since I was young, this incident really impacted my life. More so. It also impacted the lives of the 3 other individuals that were with me during this incident. We were told by our Flight Chief to never speak of what had happened and although we had to fill out a statement of the event, we were never briefed or given updates about the topic any further. The incident pretty much was erased. Since then, I would hardly talk about it, only to those I trust if need be. Last year, I was listening to an episode of Coast to Coast AM and heard Mr. Hastings wanting to communicate with any former military workers who had UFO experiences while on duty. Normally, I would not have even thought twice about contacting ANYBODY outside my inner circle but, I felt compelled to do so. After speaking with Robert, I knew he was serious about shedding light on this topic. Not only that, he was extremely respectful and caring. What I don’t understand, is how individuals who do not do their own research (meaning actually going out in the field and doing legwork), can dismiss someone that does. I guess when someone’s a “skeptic”, they have no choice but to be skeptical of everything or that title means nothing. We knew what we experienced that evening in late 98 was not something considered conventional. Nobody, even a skeptic can take that away from me, and if someone wants to work hard on exposing this topic like Robert Hastings is currently doing, they have my support. Don’t hate, appreciate! At least do some real research and contribute!